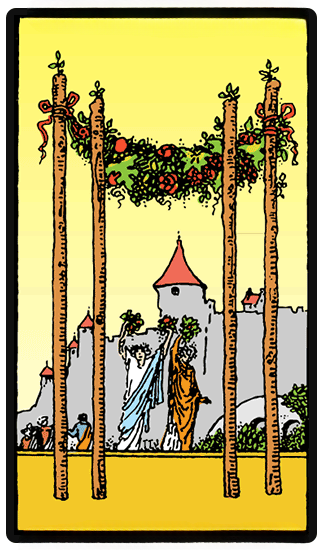 The overall meaning of the Four of Wands is that it heralds celebration as well as a harmonious, happy and relaxed home environment. In terms of numerology, the number four symbolizes stability as well as particularly reliable foundations. These are associated with a period of happiness and balance. The symbolism within the Four of Wands poses that this is the perfect time for you to get together with close people such as friends and family. This could be with or without any special occasion. Oftentimes the card is known to reflect a period of holidays when you are together with your friends and family for an extended period of time. It might also be suggesting for you to invite your closest friends for a great and intimate dinner and share a laugh or two. Oftentimes the card is known to reflect a period of holidays when you are together with your friends and family for an extended period of time. Furthermore, if you have been working on a certain project, this card entails that you will be reaching a particularly important milestone. This is going to provide you with grounds for celebration which is also to be considered. You have managed to complete a proper and paramount phase of that project, and meaning you have every reason to be feeling proud and satisfied, which are amongst the general feelings induced and reflected by the Four of Wands card. If the upright position of the card reflects balance, stability, and harmony, the reversal position of Four of Wands implies that there is a breakdown or complete lack of harmony in your family or in your home. It s highly likely that there is a lot of tension between the members of your family or other loved ones. If you have completed something that is important to you, you are expecting to share it with those that are closest to you, and to come home to a welcome celebration, but instead, you find a lack of support. This may leave you feeling rather uncertain when it comes to your own relationships as well as the things that you can and cannot depend on.